Between the anticipated advent of “too cheap to meter” atomic power and new advancements in industrial automation, grip there was a very real concern in the immediate postwar era that human endeavor would soon become a thing of the past. 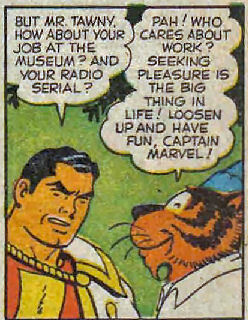 Some groups, pills such as the forerunners of the Situationist movement, recipe saw opportunities for a brave new world liberated from soul-staining toil, while others worried that the foreseen obscelence of the Protestant work ethic would inevitably lead to a terminally decadent state from which not even a civilized talking tiger could escape. 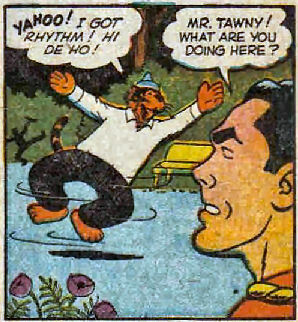 Unlike some of his feral brethren who’d think nothing about sunning themselves in a jungle clearing while coasting a week on the carcass of a water buffalo, Tawny is a real go-getter, a cat who knows what he wants and how to get it. 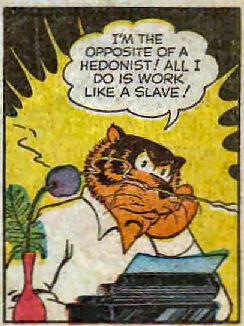 Casting off the shackles of work-for-hire drudgery, Tawny trashes his home office and makes a bee-line to the hedonist hootenanny. 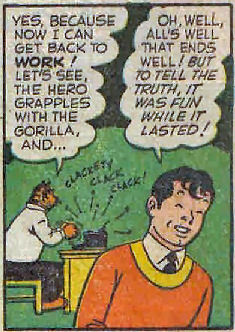 Tawny’s abrupt disappearance alarms young Billy Batson, Tawny’s trusted friend. 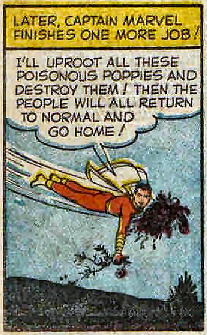 Fearing that foul play might be involved, Billy transforms into Captain Marvel and sets out to find his feline friend…and is horrified by what he discovers. The chronically uptight Marvel is unimpressed by the Bacchanalia-lite, which consists (as these events tend to do) of a bunch of white suburbanites capering around a buffet table, but Tawny has drunk deep from the cup of PAR-TAY HAR-TAY and brushes aside his friend’s platitudes about duty and responsibility. The festivities are overseen by John Jolly, a rather doughy sybarite who rocks the always-fashionable purple toga and laurels look. Marvel’s instant dislike of Jolly and of fun in general (unless said fun involves tiddly-winks) is tempered by the grudging acknowledgement that no laws are being broken by the partygoers. Marvel, a patient and suspicious soul, decides to bide his time in hopes of uncovering something legally damning enough to justify a little superheroic rough justice. 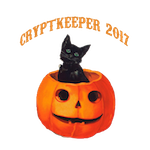 He transforms back into Billy, but is soon swept along by the current of consequence-free craziness and joins the festivities. 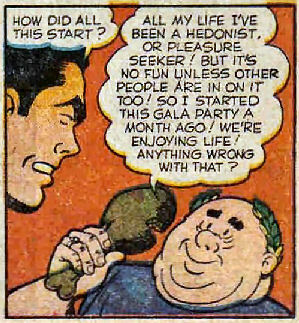 When a freak boating accident forces Billy to utter his magic word, however, his heroic alter ego uncovers the insidious truth behind the hedonist cult. 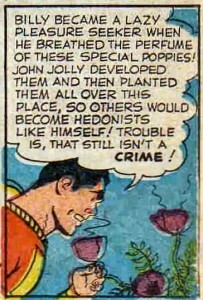 I admit that my knowledge of Fawcett City’s legal code is a bit lacking, but I’d be surprised if “growing and distributing narcotic plants in order to hold month-long orgies in a public park” didn’t violate at least a zoning ordinance or two. …which allows him to roust the revelers and give Mr. Jolly a well-deserved thrashing, which he follows up with a stunt the NATO forces in Afghanistan have long dreamed of accomplishing. With the threat to the social order eliminated, Tawny and the other opiated hedonists are given (after some protracted shakes-and-sweats sessions at the local detox facility) a fresh chance to grind away their lives in ceaseless toil, one gray, painful day at a time. 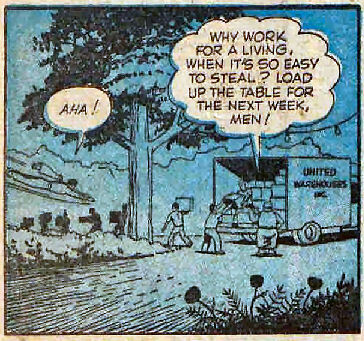 Well, thank god they didn’t steal any Hostess Fruit Pies. That’s punishable by death in Fawcett City.